The EDB to Office 365 software helps you to convert Exchange server mailboxes to Office 365 at once. It is possible to export Exchange to Exchange Online user account using the mapping option available by the software. During the launching of Exchange server to Office 365 tool the software loads the Active directory console of the Live Exchange Server. The details like: all mailboxes present, count of all the items are shown. With EDB to Office 365 utility, you can export & save the data of mailboxes into the respective MS Office user account. The mapping can be done by providing the Office 365 account credentials for each user. 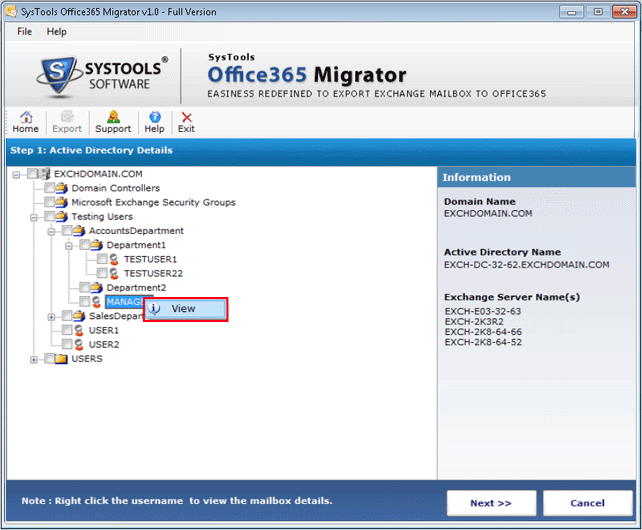 By default the software migrates all items of the Exchange mailbox to Office 365 like: emails, contacts, tasks, calendars, notes etc. But with this option you can check/ uncheck the items and can only convert as per your requirement. If you wish to switch the platform from Exchange Server to Office 365 then after the migration process the data within the Exchange server will not be of much use. In that case the utility allow you to ‘remove or permanently delete’ emails from Exchange server. With this feature of Exchange Server to O365 tool, you can apply mail filter to convert only selective set of messages. Set the date range of “To” & “From” & the tool will convert those emails only. This feature only works for emails and the other items are completely converted. 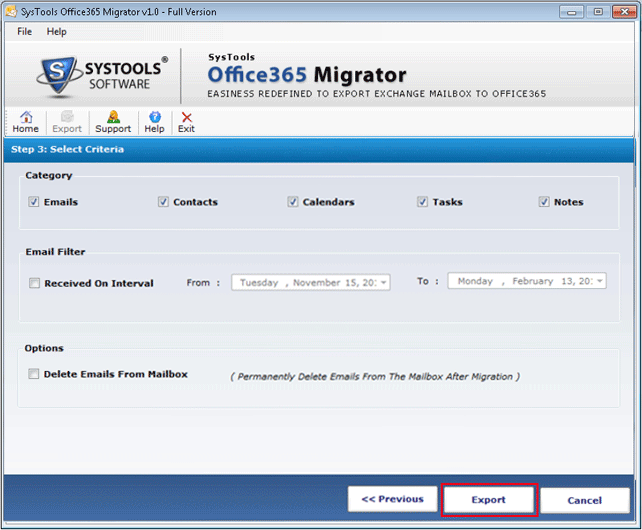 Now, click the Export button to continue with the migration process. Check the Active Directory Server is ON. Also check the Exchange Server is ON or not. Then, right click on the username to view details of mailboxes. Condition: To view the details the user must have administrator rights on the mailbox, to get administrator rights follow step3 . Now, select the users by checking the checkbox and then click on the Next button. Enter Office 365 User ID & password and then click the Next button. Select the filter & click the Export button. An Export rate will be shown by the software. 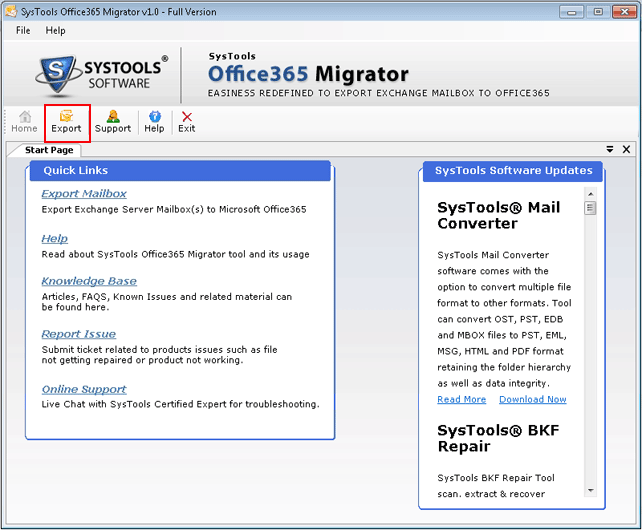 A pop up will appear showing the completion of migration of Exchange mailboxes to MS Office 365. Then, click OK.
Can I convert Exchange Server to Office 365 without its login credentials? No, if you wish to export Exchange to Exchange Online then you must need the login credential. As without the credentials the export process is not possible. Does there is any requirement of Live Exchange Server using this tool? Yes, Exchange Server should be in active mode and should be in the same domain that of the conversion machine where the tool has been installed. Does the utility support bulk Exchange mailboxes migration? Yes, the tool supports bulk migration of EDB files. 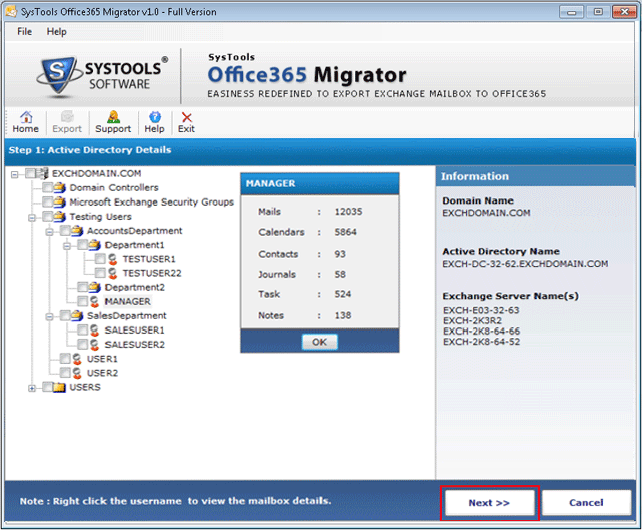 You can easily export multiple Exchange mailboxes to Office 365 at a time. Does this software run on Windows 8 PC? Yes,you can run this tool on any Windows machine. Can this converter migrate my emails only from one of my Exchange mailbox? 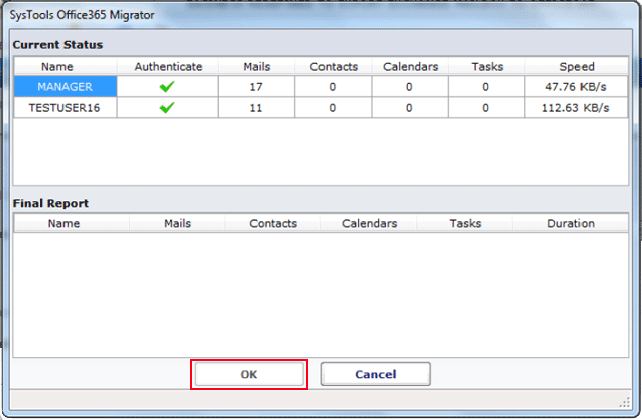 Yes, with this utility you can migrate the data of Exchange mailbox category wise also, like: emails, contacts, calendars, tasks etc to Office 365. There are a lot of software programs which offers similar functionality. Choosing from them was a difficult task. As I wanted my EDB database to be migrated to Office 365 so I asked one of my friend for the help. She suggested me this amazing tool. Thanks to the team for making such a wonderful tool. 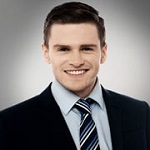 This software has many new features to convert Exchange Server mailboxes to Office 365 . I’m happy that I banked upon this tool. 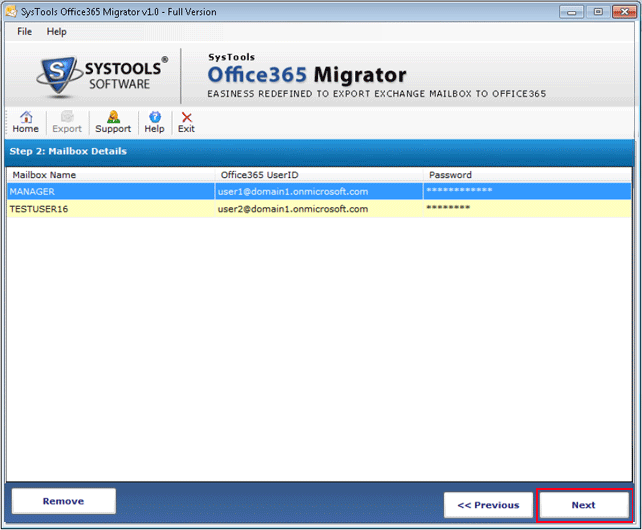 Trust me just because of this tool I was able to transfer Exchange Server to O365. I’m lucky that I searched this tool at the correct time. Thank you so much to the developers of this software.